Savage HS 300WM 24" 1-10"
But,I only had a handful of Rem brass and I have 150 pcs. of Federal inbound so I guess the load works not over after all. I will be looking for some Rem brass or working up in the Feds. start about 1.5 grains less with the federal brass, should get you real close to what you have now. I had good luck with 4831sc with the 178s. thank you, I will keep that in mind when I buy powder again.I also have some Superformance that I am going to try. 3000 fps out of my rifle and sub .5moa out to 500m this is my hunting load. No pressure signs whatsoever. I am going to try varget out next due to having to use way to much 4350 in the case and it was causing seating problem. what do you guys think about the varget?? How did the Charger test go? What twist is your barrel? 10 or 12. I have a fn pbr, I'm wanting to run 155 to 3200 for competition speed. Have you considered h1000? Found a great AICS mag friendly load. Finally found a load for 210 smk's. During load development I shot a ladder at 600 yards to determine my powder charge, then I loaded rounds to find the right seating depth. I loaded 3, 5 shot groups. 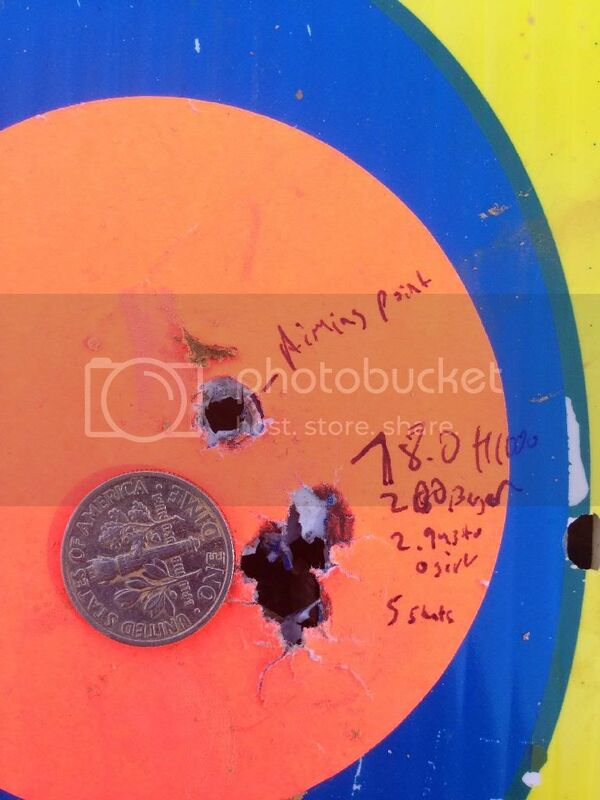 The first group was jammed .0010, it shot about 2 inches. The second group was just touching, it shot about 1 inch. The third group was jumped .0010, it shot about .5 inch. Have you guys seen that big of a difference just with seating depth? something else I found with smk's. If I set my seating depth from the ogive, the oal with be within a thousandth almost always. The bullets seem to be very consistent. Pulled the 5th shot a little unfortunately, but this was my first 5 shot group with this charge. Still very pleased with it. I read thru all loads. Anyone use Hodgdons Retumbo Magnum rifle powder? See post 363. I use 77.4 grs of Retumbo. Work up to this as your chamber may be different. Thanks I must of missed that one. Deerhunter28, IMR4831 works really well with the heavies, 230-240gr(67 or so grains). I am loading 208 amax over RL-22 into FC brass. I have noticed that federal brass is heavier than others and I am assuming this means less volume inside. With a recent test I was loading per Hornadys data and getting velocities above what the book indicates. Worked up to the max load with this result. Ref the post above: trying to slow these down a bit and it's not working out. Worked my way down to 71.5gr RL22 and we are still above 3000fps. Causing heavy bolt lift and a few fail to extract. Reading my books it says lower end charges can lead to over pressure. Not sure I understand that but also not sure what to try next. I'm just starting to work up a load with Black Hills Brass (Win), H4831, and the 178 Amax. Care to share your findings? Of course I will work up slowly, but it's good to have a reference point. Or does anyone else have a decent load for this combo. One more month and I should have all my Federal brass here. Looking to build 208 AMAX & 190 SMK loads with IMR 7828SSC. With the "un" availability of H1000 I'm leaning towards this to be "the" powder for me. Savage 24inch HS-Precision platform. Been having really good luck with Retumbo and the 230 bergers as well as the 215's. I've got a 30" Broughton 5c and it gives me about 70 to 100 fps more than h1000. Very good powder for the HEAVIES. whats every one's primer of choice? i have a long range shooting school coming up in a september that i need 500 rounds of mach grade. i will be loading hornaday brass with retumbo and 208gr A-Max's just haven't found much on what to light it with. i haven't loaded for precession long range just gas guns to this point. not looking to get it dialed in 100% as I'm no where that good. just going to make an attempt at a ladder test then plan to load the needed 500rds as close to exact shell to shell as i can. I did an unscientific test of CCI 250, WLRM, and rem 9 1/2. I loaded 3 rounds with each primer and shot groups at 100 yards. The CCI's grouped the best, so that's what I use. Some powders are just that way. H110 and Win296 (magnum pistol powders) are almost always compressed loads. Anything less than 95% case fill can be dangerous with some powders. On the H110 and Win296 there is no "starting load" there is just "the load" backing these powders down more than 2% is not advised. This was shot out of a VERY long throated Win Mag. Is .195 moa and 3090 to 3110 fps. 175 gr Sierra Match king HPBT . Rem 700XCR Tactical 26" stainless heavy barrel . So has anyone finished their testing with the 300WSM and Berger 230gn Hybrids? Interested in what velocities achieved and powders used. Shot off Harris bipod and Crown Royal rear bag. Load probably shoots better. Not gonna lie... The sans brake 300WM muscled me a bit. Just a quick THANKS for all the posts on 300 wm. I went with this as starting point from reading posts. then up and down with powder. 76.8 perfect! How far off the lands are you seating the 208 HPBT? I think I have the load at 20 off the lands, 208 HPBT being pushed by 77 H1000. Its under 3/4 inch but I need to egt it down to half moa or better for 1k shooting. tightened up considerably, even with a warm barrel. I got best from 75 and 76, and for some reason they opened up at 75.5. So I now have 40 ladder loads ready 74.8, 75,75.2, 75.5, 75.8, 76, 76.2, 76.5. I should make some for 76.8 but the original 77 opened up a bit. My AOL is 3.468 and am still having issues where the AMAX tip is getting nicked in the mag. Have you seen this or have you just been doing single loads and no mag? I'm also using once fired Federal brass with Federal Magnum primers. Hornady 208 Amax bullets seated .020 off of the lands-3.600" O.A.L. 2960 fps avg.- confirmed at 1150 yards-no over pressure signs and no powder compression at 3.600"
.4" groups at 100 yards. 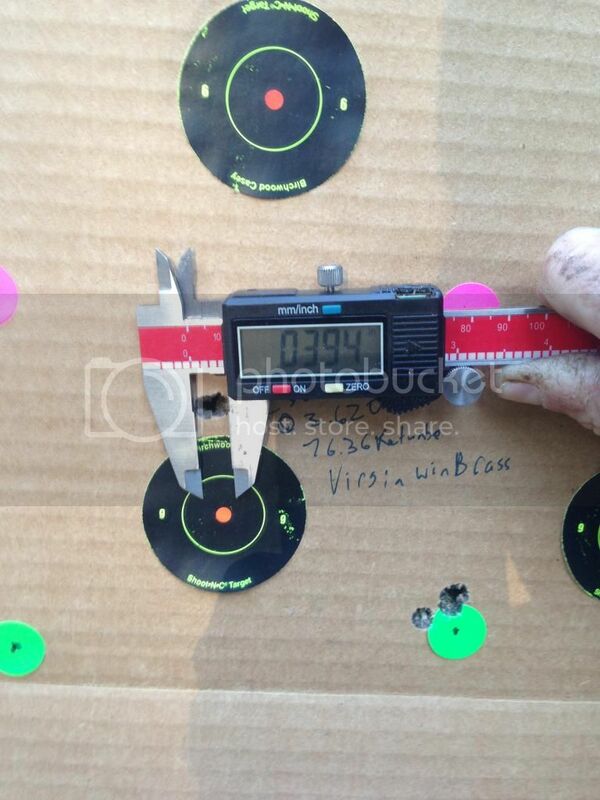 The 208 Amax absolutely did not like to be seated at my factory mag length of 3.45"-my groups were over 1.5" at 100. .010" off the lands and groups opened back up to .75". .020" off the lands is the sweet spot on this gun with the 208 Amax. I have some 210 Berger bullets to try next. Anyone playing with the Nosler 220 Custom Comps? I cannot find info on a starting load. also what was your start load? The cases are once fired Mil Spec Federals and they are loaded to 3.6" (.010" off the lands), Right now I'm working on magazine length loads at 3.90"
Thank you for getting with us at Berger Bullets. We are including our latest update for use with your .300 Winchester Magnum. Please do not hesitate to get back with us if we can be of further assistance for you. I'm thinking of 75.3-76.8, in .3 increments. I wanna shoot 3each , which is 6 loads for 18 shots. I feel like I may miss a node low or high. Should I just shoot a ladder test at say 200 yds, from 74-77, in .3 increments? Seems like a wide range. more info on what your loading. Sorry. 73.5-76.8. H1000 and 208 Amax in my 110BA. ACOG Reticle - Anyone ever seen this one before?